Ronda Rousey is best-known as an Olympic medal-winning martial artist in Judo and UFC Women's Batnamweight Champion. In more recent times she's appeared as a professional wrestler in WWE. It's also well documented how the talented fighter and actress enjoys playing a variety of video games in her downtime. With this in mind, Rousey has been spotted on her social media pages promoting the upcoming Mortal Kombat 11 reveal, taking place in Los Angeles tomorrow on 17th January. In her Twitter and Instagram posts, Rousey says she has been waiting to accept this invitation her whole life and also mentions how the Earthrealm is safe with her. According to Game Informer, this seemingly confirms her involvement as a voice actor in the game. 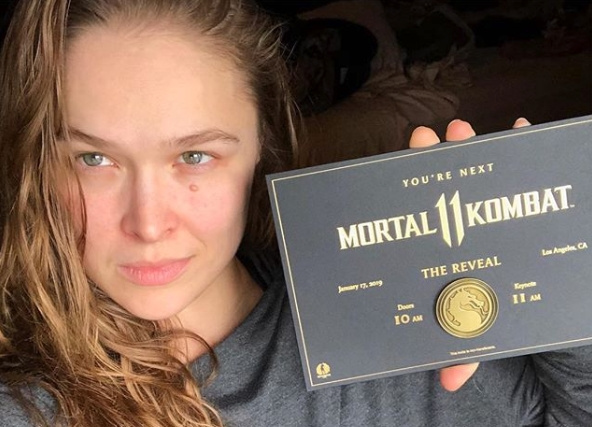 It all stems from a rumour posted on Reddit last year which suggested an internal email had revealed the iconic female mixed martial artist would voice Mortal Kombat's special forces officer Sonya Blade. Are you excited for Mortal Kombat 11's big reveal? Tell us below. WB and Friends are really making a big deal of this, aren’t they? I personally don’t understand why the reveal of a new MK game needs to be treated like a global event. Nevermind, I forgot that developers and publishers always create a whole extravaganza over new fighting games. I also do have to admit that the invitation and the coin on it do look pretty cool. @GyroZeppeli probably because the last one sold over 10 million. Ronda Rousey isn't really working as a plus in my purchasing decision making, but ok.
looking forward to the Switch Edition of this game very much. the last two MK games have been delightful! would be nice to see WB hire a spokeswoman who wasn't a phobic nightmare though. @GyroZeppeli It's a popular series that's been running for over 25 years. Any new entry is hugely anticipated so it makes sense for them to make the most of its reveal. I just hope the Switch port won't be downgraded to 30fps. It's a 2D fighter so it should be able to handle it. ...and I hope it actually looks good. The last game was the best-selling in the series by quite a way. They're trying to capitalise on that and cement a permanent AAA position for the series. So excited. Very, very excited. Cant wait to have this on the go. Rumor is she's playing Sonya which I hope isn't true because the woman cannot act to save her life. @Dezzy That makes more sense. I would have assumed X sold a bunch, but I didn’t know it was miles ahead of the others. @OorWullie I get what you are saying, but there are many older popular series that have not seen nearly as much press when they released a new game, i.e. Sonic and Mario (sort of). DBFZ is in Unreal Engine 4 and runs at 60fps on Switch. No reason why this game can't. Rousey? Hope they didn't plan on selling any copies to Gen Y. @Daldra As far as I know Mortal Kombat X sold about 5 million copies. Where did you get the 10 mil statistic from?? Why are you showing Rousey? literally hundreds of other people also got this invite and also have nothing to do with the game. @WaveBoy That game is in Unreal Engine 3, though. An outdated engine that the Switch runs casually with games like Paladins at a full 60fps and that game is way more demanding. I have faith. Hmmm, well either way it doesn't matter to me since I would just be getting it on the PS4 instead. There's zero benifits of it being on the switch outside of portability which doesn't really interest me anyways. Get it on the PS4 and you'll be getting the best visuals, resolution ect. This is the game that makes Sega 'cool' in the 90s. Now Nintendo is finally 'cool' enough to have this game. @Alucard83 MK is just a fighting game with two players on a static background. There's not much to render. Not to mention MK9 ran at 60fps and the PS3 and 360 ran on mere MEGABYTES of ram. So I'm still confident. @WaveBoy Yeah well I don't have a PS4 like some people so I'm holding my optimistic values. @mist Yeah. She's a female fighter so of course you have to comment on her appearance and attractiveness. Grow up buddy. I expect UpUpDownDown to do a video from the reveal as well. @Lizuka your point? Videogames turned into movies don't require Emily Blunt or any award winning actor. Were talking Mortal Kombat here. Fun, yes, but seriously dumb. @Pazuzu666 The point is that Sonya has a perfectly fine voice as it is and I can't imagine anybody on earth would go, "Oh, I have to buy this fighting game for this ONE specific voice actor!" Casting someone who's a bad actress whose only real positive to including her is that she has name value - and even then that doesn't seem to actually mean anything given she has done absolutely nothing for WWE's ratings - is just stupid. There's a reason the Roadhouse remake died the second her MMA career did. 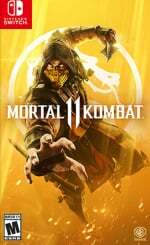 no mortal kombat 9? or 8? or 7? or 6? you pay attention to WWE ratings? I don't know much about sports or athletes, but the whole reveal sounds interesting. @Reignmaker Whenever I see her though I'm reminded of Holly Holm nearly taking her head off, so for me its a plus in that sense. RR for smash b ultimate and mk11 confirmed. @CharlieSmile What makes her a "phobic nightmare?" I know little about her, I'm genuinely curious, thanks. @CharlieSmile No reason to be snippy about it, your original post said "phobic" which could mean any number of things, not trans-phobic specifically. @Racthet916 did not intend to be snippy, I apologize for coming off that way. just not looking to get more people blowing up my notifications by talking about it.